Thanks for allowing us to serve our community for the past 21 years! Texas bluebonnets are annual plants, meaning they go from seed to flower to seed in one year. They germinate in the fall and grow throughout the winter, and usually bloom around the end of March to the mid-May. Although this beautiful wildflower can be found across Texas every spring, bluebonnets can be tricky to get established. It may take several years to establish a good stand of bluebonnets and they do require some particular conditions to thrive. But once they are going, your bluebonnets should reseed and reappear each spring. Visit this link to learn more about growing your own bluebonnets: Bluebonnets. 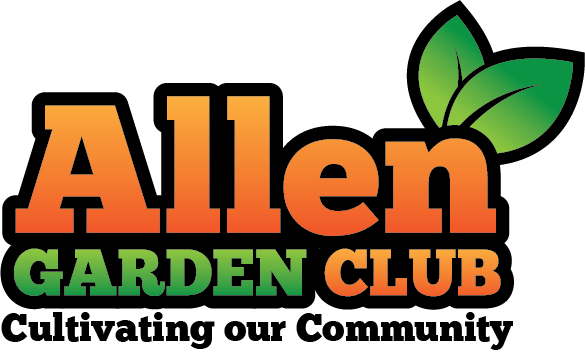 Click the link below to make a donation to the Allen Garden Club to support our community service projects. The Allen Garden Club is a 501(c)(3) charitable organization. Donations are tax deductible.